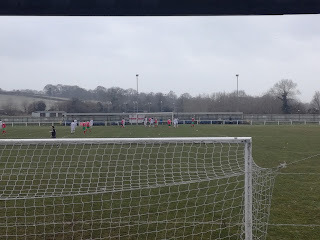 Having survived the rigours of my Stag Party the previous day, which consisted of a Trans Pennine Beer Trail, taking in the likes of Stalybridge, Marsden, Huddersfield, Dewsbury and Sheffield, I felt surprisingly sprightly for a day at the football. 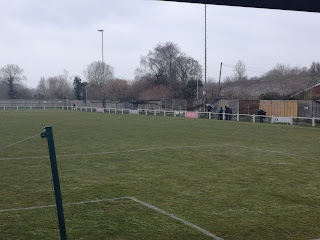 The weather had not been overly kind, and with snow and freezing temperatures forecast, once again, I did have a few concerns whether my game of choice would be on, but it appeared Chalfont St Peter had no plans for a pitch inspection and the snow was not settling. I was to have company, Alfreton Town’s scheduled home game with Kidderminster Harriers bit the dust early in the morning so after a couple of phone calls, my old school mates Mark and Lee were to be jumping on board. It appeared, the Stag event was about to enter a second day! The familiar path of the M1 and M25 was on best behaviour, as was the weather, and despite a biting wind and constant flurries of snow, all was well as we pulled into the car park at Mill Meadow in the scenic Buckinghamshire town. It was an important game for both sides. 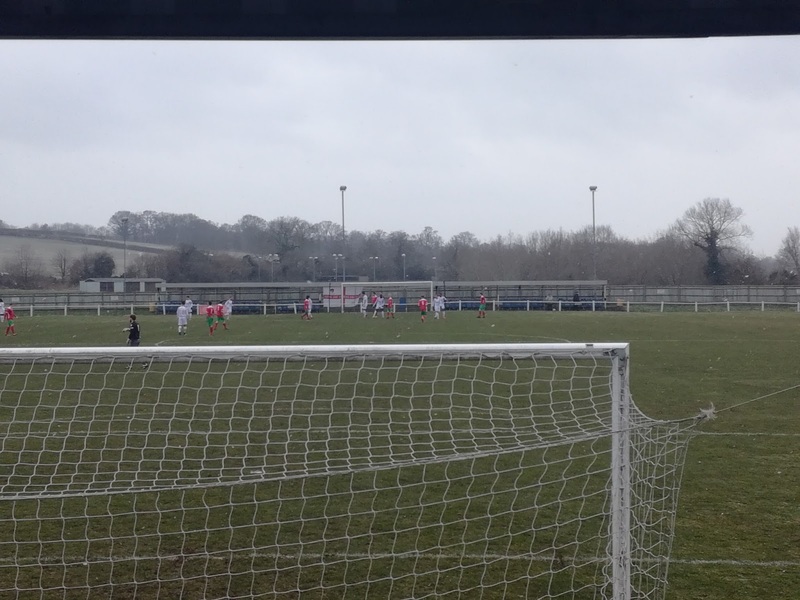 Chalfont sat in the final play-off place while neighbouring Hayes occupied third place. It was quite conceivable that the two sides could meet again in the end of season lottery, but for now, it was about securing the points to cement the final positions that would be so crucial. 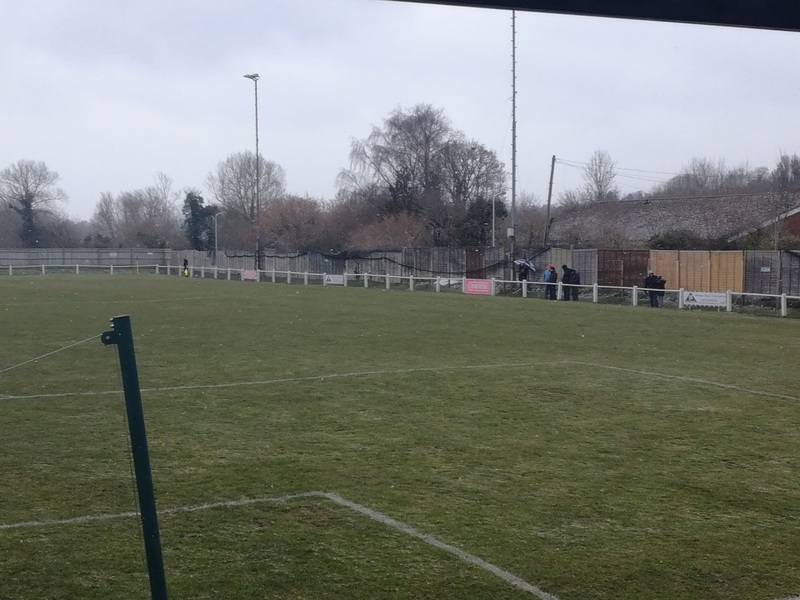 Chalfont St Peter, since the mid-Seventies, have worked their way through the Spartan and Athenian League’s, until arriving in the Isthmian League in 1984. 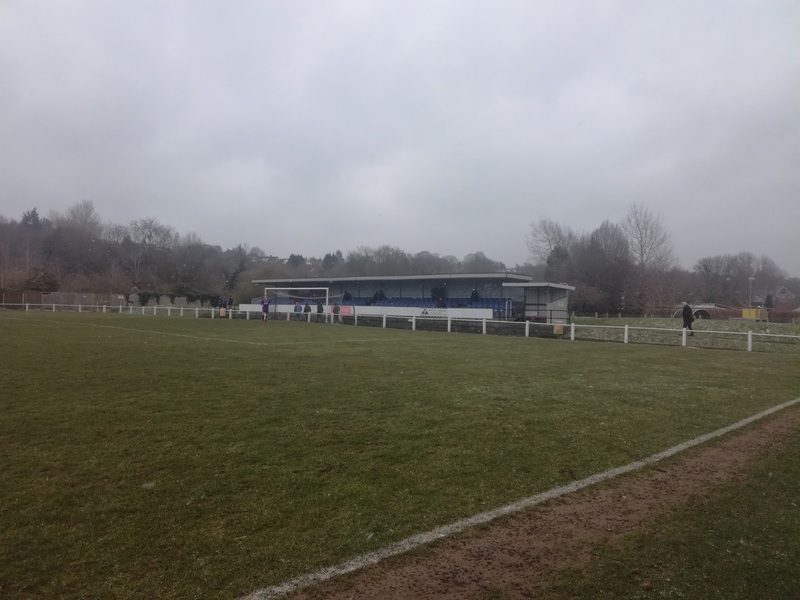 They remained Isthmian’s until 2006 when they joined the South Midlands League, and it was in this competition that they found success. Two second places, a third place and a Championship in 2011 saw them promoted, this time to the Southern League, where they have remained since. 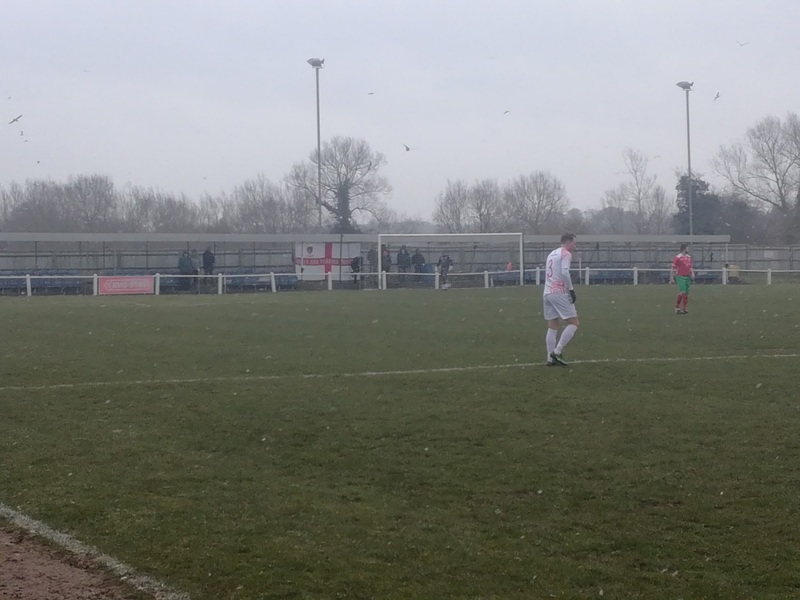 Hayes & Yeading United, where I went last Saturday, are a club looking to revive former fortunes, and bought with them over half of the attendance of 135 that were inside Mill Meadow today. Chalfont’s average crowd this season is 82, the lowest in the division, which is a pity given how well they’ve been doing. Only the home game with well supported AFC Rushden & Diamonds drew a bigger attendance than today’s, so quite what they need to do to get more people through the turnstiles is a mystery. Mill Meadow is a real mixture of the traditional and modern. 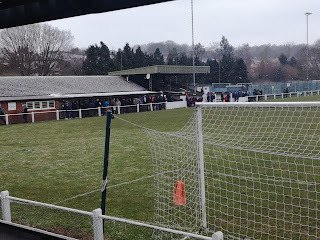 Once through the turnstiles an old wooden building sits on the West side of the ground, and this contains the clubhouse, offices and tea bar. A small overhang in front of it provides shelter for supporters who wish to stand and watch the action. Next to this is a stand on the half way line, but it had seen better days and given the lack of people sat in it, I suspect may have been declared out of bounds Underneath the stand is the dressing room area. Behind both goals are seated stands. 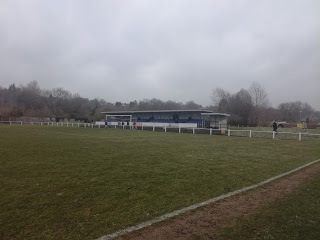 A modern version sits behind the South goal and given it’s raised position it gave excellent views of the game, whereas behind the opposite goal is a smaller, less substantial structure with a much lower rake of seats. The East side of the ground was open, whereas the pitch, given the recent weather, was in very good condition. The game got off to a blistering start. Louis Stead finished after Victor Osubu saw his initial shot saved for the hosts inside four minutes, but almost straight from the re-start, Manny Duku rose to head home an excellent cross from Toby Little for the equaliser. The rest of the first half was end to end stuff, with both teams determined to gain an advantage, but no more goals were forthcoming. Ten minutes into the second period and Hayes were feeling a sense of injustice when they had what seemed a perfectly good goal disallowed for offside. Moments after this and that injustice became ever more tangible when Chalfont were awarded a clear penalty. Up stepped Osubu but his spot kick was blazed over the bar, much to the visitors relief. Chalfont had the edge in the remainder of the half but couldn’t find a winner. Another straightforward return journey saw us back in Belper for just after seven, and Mrs H was very kindly on hand to brave the snow covered roads to give us the short lift into town. Much banter and brew was enjoyed, and as we made our way for the last bus, it was clear that conditions had significantly deteriorated. An agitated bus driver allowed us on for free, because, to quote him, “I’m not sure how far we’ll get”. We all made it home one way or another, the Stag remained in one piece for a second evening. But today had been a great day on numerous fronts, but mainly because of the great company. Sometimes the best days are the unplanned ones. Talking of plans, got a fairly big one coming to fruition in less than a weeks time. It’s a big match, played behind closed doors on an artificial surface. All ticket, with hospitality for all, and it’s almost guaranteed to go to extra time. There won’t be any losers in this match though, only winners…..